You’ve been SUP’ing all Summer and loving it, but you’re now ready to step it up a bit. 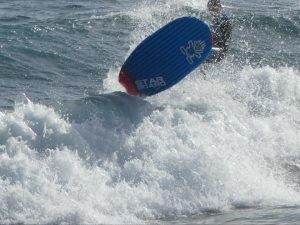 You’re in luck, Autumn has arrived along with the swell, time to get stuck into the most dynamic form of SUP, surfing! Here’s Five things to think about to get you up and ripping in no time. Pick your spot – Just because there are surfers in the water doesn’t necessarily mean it’s a go for you on your SUP. 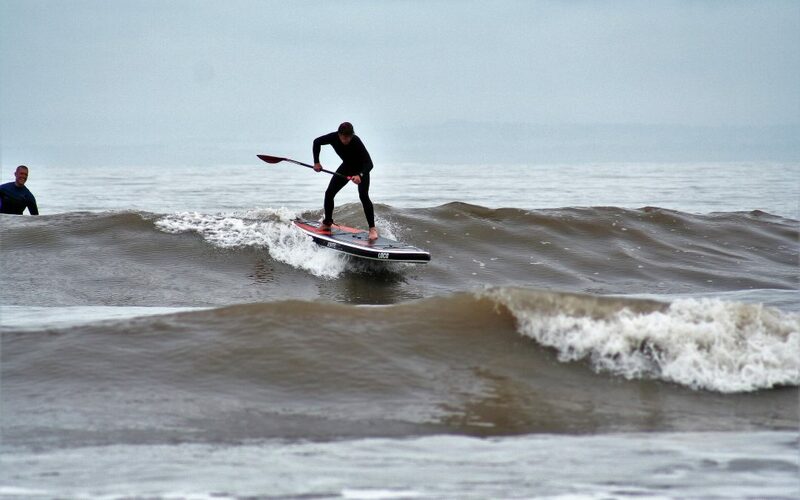 If you’re venturing out for the first time on your SUP in the waves you’ll need some space – crashing through the line-up, lopping off heads with your paddle won’t win you any popularity contests! Pick a big, preferably sandy beach with friendly spilling waves – here in North Devon, places like Westward HO! Saunton Sands and Woolacombe are ideal. Pick a buddy – This time of year most beaches will not be lifeguarded, so take a buddy with you so you can look out for each other – and have someone to reminisce about just how “pitted” you got on that wave over a pint, post session. Don’t have any friends? No problem, if you pick a SUP friendly break, making sure you keep a respectful distance from other SUP’ers so as not to get in anyone’s way – most people keep an eye out for each other so you’re all good. Last resort, convince a non-SUP surfer friend/partner, just how much they’d enjoy a day at the beach in November watching you getting ‘educated’ by the ocean…everyone’s a winner. Pick a board – The board you can take to beach today is the best board in the world! Yes, surf specific SUPs will perform better in the surf but there is a lot you can learn about SUP surf on the board you’ve already got. A couple of points to remember: If you’re riding an ISUP make sure its pumped up to its maximum recommended PSI, anything less will be like trying to catch waves on a giant flip flop. Check your leash, consider changing your coil leash for a surf leash approximately the same length as your board. If you’re using your existing leash, check the Velcro closure is in good condition, the potential forces generated in the surf could pull the leash off your ankle if not. Pick a Forecast – Everyone enjoys a good trashing in the surf, but if you want to learn how to catch waves, you’re going to need a decent weather and surf forecast, to ensure you’re not a sweaty, terrified mess on the beach after 10mins having caught zero waves. When learning to SUP surf, getting out past the white water is the biggest barrier (literally) to catching unbroken waves. Every spot is different, but as a very general rule a surf forecast of 1-2/3ft and a swell period of 10+ seconds will mean you’ll have fun waves to surf and be able to get out the back fairly easily. Look for a forecast when the wind is around the 10mph mark. Have fun and enjoy the ride – I recently saw a guy yawning and checking the time on his watch while surfing a 1/2ft frothy wave straight to the beach, trying to exude an air of boredom…don’t be this guy, unless you’re considering a forehead tattoo saying kook! Once you’ve can catch a wave and ride it to the beach you’re doing great but this is just the beginning – have fun, push yourself and remember, catching waves is more addictive than almost anything else you can do in the world, so don’t be surprised if the first thing you think about in the morning, most of the day and last thing at night. Something to aspire to, Ben Pye getting some air time. Keep a look out for our next article on catching waves by subscribing to the blog.